TandemThings: Kat is back! Ride report: Dumbarton / Hamilton 200km. A more eventful day than we expected. Kat is back! Ride report: Dumbarton / Hamilton 200km. A more eventful day than we expected. On Tuesday, I went to pick up Katina from the local dealers. We are officially a two tandem household again :-) After a quick fettle to fit some aerobars, the saddles and luggage capabilities, we needed a proper shakedown ride to check everything was working. We entered the Dumbarton Hamilton Roundabout permanent which starts about 5 miles from our house and is a lovely route. It starts with a pootle along the bay trail to the Dumbarton bridge, where we cross the bay and take a very gentle climb (almost flat), through Newark to Livermore. It then climbs Mines road to the great cafe ‘The Junction’, before following San Antonio road up the backside of Mount Hamilton, before descending to San Jose and back to Sunnyvale. The ride was slightly more ‘interesting’ than we had planned, but we learnt quite a lot. We have two “big” rides planned this summer, and both could be very hot, so we thought it would be useful to try cycling in extreme heat to see how it affected us. We already knew that wearing white clothing and regularly dousing it with water helped keep the heat down, but was interested to know whether this was enough. As it turned out the answer was no, especially when climbing. Within a mile of the start of the Mines Road climb, we were sat in the shade of a tree, wondering whether we should just turn around and go home. In the hot sun, water evaporated off clothing very quickly, and only gave relief for a few minutes. It was better than nothing though. On shallow grades we could ride without overheating, holding enough speed to give some air-cooling effect. But on steeper grades we needed to stop and rest in the shade regularly to cool down! Later in the day when the sun wasn’t so strong but the air temperature was still very high, we found the arm coolers to be less effective. In some ways, even though it was cooler, it was worse to cycle in as there was no respite from the hot air. We actually engaged the “24 inch” (or should that be 48 inch?) gear a few times, as we could walk along in the shade, but we were still overheating when cycling. At Livermore, we bought an extra litre bottle of Gatorade to put in the saddle bag. For reasons unknown it decided to completely empty itself, despite there being no obvious leaks and the lid still being firmly attached. As the carradice saddle bag isn’t fully waterproof, this caused it to drip Gatorade all over the rear wheel, including the disk brake. We had wondered what on earth had caused it to start behaving strangely. It also turns out that Gatorade is a fairly effective clothing dye, as Joth’s transparent gilet is now a fetching orange colour. When changing a tube on the rear wheel later in the ride, we also discovered that the rim, tyre and rear triangle were rather sticky too. Our nice clean frame didn’t stay clean for long! The air quality in the bay area isn’t all that great at times. Fortunately, you don’t need to go too far to find better air. There was a ‘spare the air’ alert on both Friday and Saturday indicating that the level of low level ozone in the area was high, and “Vigorous outdoor exercise should be undertaken only in the early morning hours when ozone concentrations are lower”. We normally don’t suffer any problems with poor air quality, and we were fine until we reached Livermore. On the way into town, we could see a fire in grassland to the North which engulfing Livermore in a thick cloud of white smoke. Indeed, a short while before we’d been passed by a siren-bearing flatbed truck carrying Caterpillar earth moving kit: a sure sign of forest-fire trouble. Cycling through the smoke cloud was really difficult, and gave Joth a huge coughing fit. Fortunately the Safeway control was nicely air conditioned, so we could hide out inside while the worst of the smoke cleared. I’m not sure if the smoke had an ongoing effect, but we both struggled to breath deeply all day. When we got to The Junction cafe, we were hot. I saw the couple in front of us buy something which looked extremely attractive, so I ordered the same. I’m not normally a big fan of root beer, it tastes a bit medicinal for my liking. A frozen glass filled with vanilla ice cream and accompanied by a bottle of Henry Weinhart’s Gourmet Root Beer. Smooth, creamy and extremely cold. Perfect! We spent well over an hour at this control, and although it was cooling down, the thermometer was still reading 103 °F when we left just after 4pm. 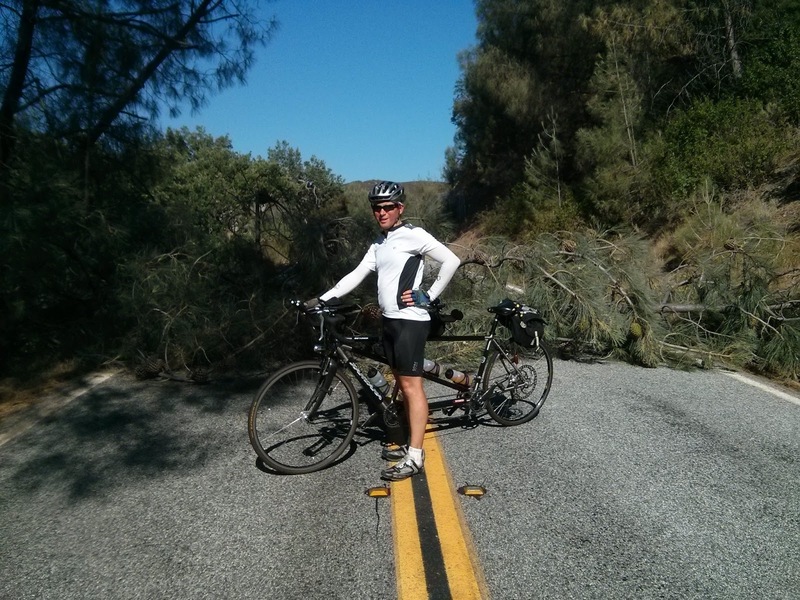 A tree had fallen across the San Antonio Valley Road which made for a small additional challenge. 5 - Once the temperature drops, we speed up. We got to the top of Mount Hamilton with *just* enough time to know we could get back to the final control in time if we pushed. Having soaked our jerseys in water at the mountaintop Lick Observatory, the upper part of the descent was wonderfully cooling. By the time we reached San Jose, the air temperature had dropped, and we were able to put some power in. It seemed strange that little over an hour before we had been walking to avoid overheating, and eating glucose tablets as though they were smarties, as we’d had problems eating (or more specifically, digesting) in the heat. The route back to the start has many traffic lights, but between red lights, we were actually going very well. Some of the quickest cycling we had done all day. We got back with about 15 minutes to spare. Our longest 200km ride by quite some way!